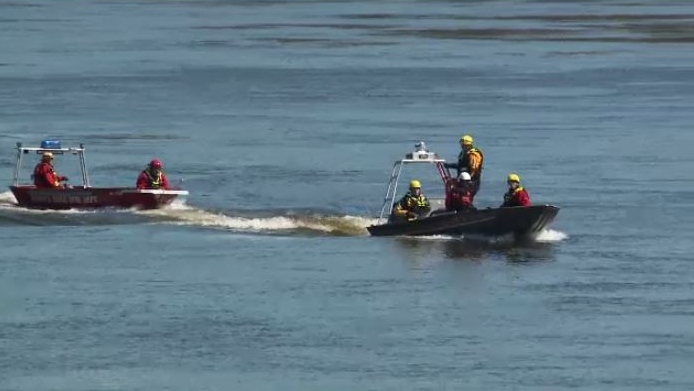 The weather is warm and the water is flowing along the St. John River in New Brunswick which has officials on edge, watching river levels for any signs of flooding. At the same-time, they're also preparing in case those fears become reality. The temperature of St. John River was about one degree -- but still frigid and flowing fast on Sunday at the base of the Mactaquac Dam. Conditions were perfect for some firefighters to dive in and do some training by doing a simulated rescue. “Swift-water swimming techniques is a really good rescue tactic and it's important for both rescuer safety, but also a useful skill to be able to access different parts of a river or flooded area,” said Steve Ruskay, technical rescue instructor for Raven Rescue Safety Medical Canada. The mighty St. John flooded its banks like never before in 2018 as thousands of homes and properties were damaged by the quick-rising water. Fortunately, there were no deaths associated with the flood and these firefighters are training to ensure there's none in the future. Specialized instructors have come in from Ontario to do the training. 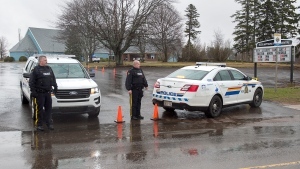 “We've developed this course in conjunction with the Oromocto fire department basically custom-tailored to the skills they feel they require for this area, and that's based on the past number of years of having flood responses,” said Ruskay. “We do still have a lot of water content in the snow in the upper basin, and the next three weeks are going to be very critical on what happens,” said Price. New Brunswick EMO has released a weather warning for the next 24 hours as they are expecting lots of rain to fall. “When rain does occur, we're hoping that it is limited and it allows the water, you know, takes that water content out of the snow up north and brings it down through the river slowly and gradually,” Price said. But in the event of a flood, there are 14 firefighters in Oromocto who are trained to jump in to help. They are hoping the public is alsoprepared for what could come. The next three weeks will be about waiting, watching the water, and hoping for the best, but officials are advising people, especially those who live along the river, to be prepared for the worst. The temperature of St. John River was about one degree -- but still frigid and flowing fast on Sunday at the base of the Mactaquac Dam. Conditions were perfect for some firefighters to dive in and do some training by doing a simulated rescue.